The new Nissan Armada capitalizes on every detail for breathtaking performance and head-turning style. Dominate on and off the beaten path in the new Nissan Armada. This full-size SUV delivers the power you want with its 5.6-liter direct-injection V-8 engine, kicking out 390 horsepower and 394 pound-feet of torque. 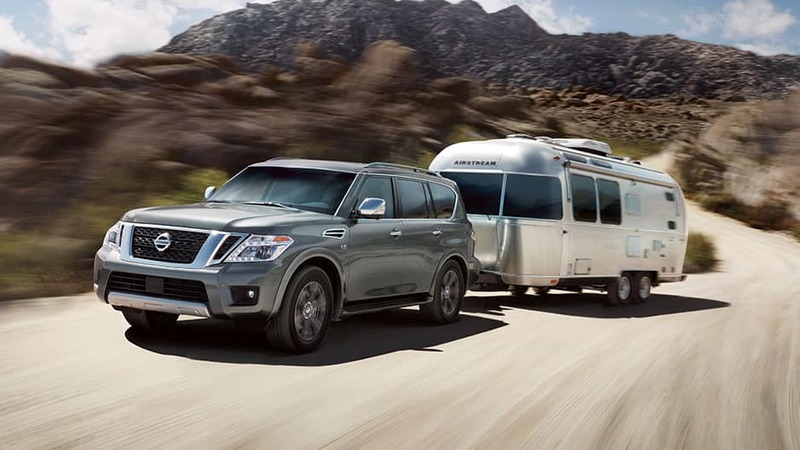 With all that power, the new Nissan Armada boasts an 8,500-pound towing capacity, so you can bring your boat, jet skis, or trailer with you on your next adventure. 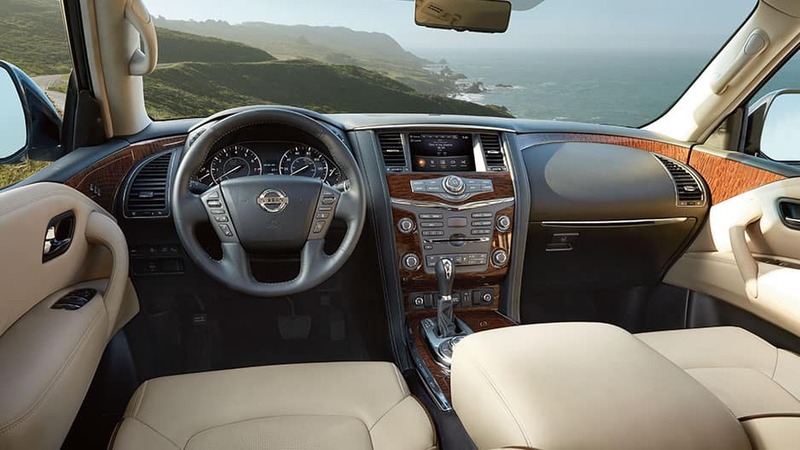 Slip behind the Nissan Armada’s wheel and take in a luxurious interior featuring heated leather seats, distinctive stitching, and wood-tone trim. The new Armada seats up to eight and offers 95.4 cubic feet of cargo space with the rear seats lowered. 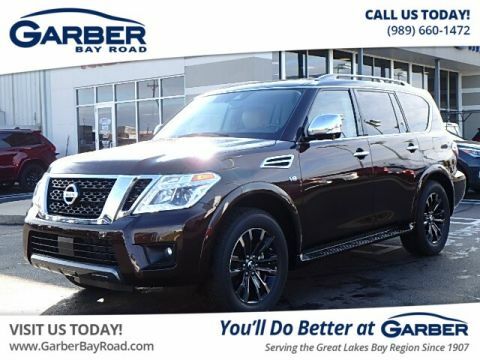 Whether you’re commuting to Midland, dropping the kids off in Bay City, or spending the day shopping in Birch Run, the new Nissan Armada has all the space and style you need. 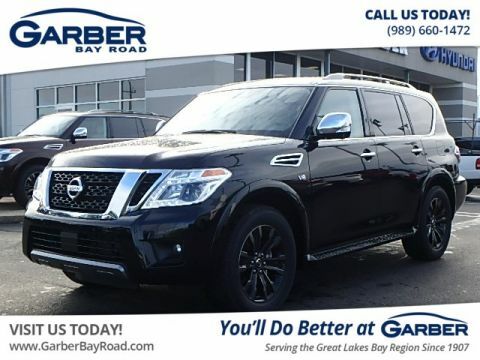 Experience the new Nissan Armada for yourself today by scheduling a test drive with Garber Nissan on Bay Road in Saginaw. 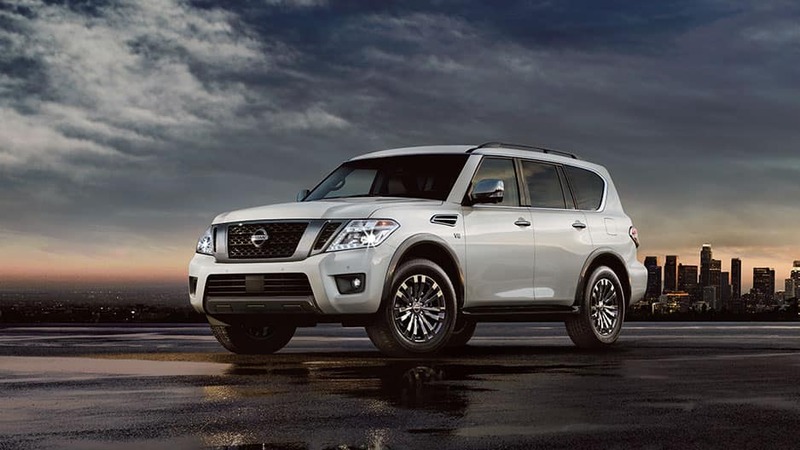 The new Nissan Armada casts a powerful road presence that’s sure to turn heads with bold lines, LED headlights, a muscular chrome grille, and 20-inch wheels that provide remarkable curb appeal. The new Nissan Armada offers undeniable curb appeal with its chiseled body, bold stance, and muscular chrome grille. On each side of the hood you’ll find chrome air vents that add a sporty vibe to this full-size SUV. Nissan paired the new Armada with signature LED headlights and taillights that cast bright light farther down the road than traditional bulbs and ensure vehicles around you notice your movements. Even at a standstill, the new Nissan Armada ensnares attention with its 20-inch wheels available in machine-finished aluminum-alloy and dark chrome-clad aluminum-alloy. Cold weather can’t stop you in the new Nissan Armada with available heated side-view mirrors. Activate your rear defroster to heat up the side-view mirrors and ensure you have a clear view from all sides. Load and go with ease courtesy of the new Nissan Armada’s power liftgate. Press a button on the Nissan Intelligent Key and the liftgate will raise to reveal 95.4 cubic feet of cargo space. Every road trip is an adventure in the new Nissan Armada. This full-size SUV offers seating for up to eight, 95.4 cubic feet of cargo space, and the comfort-focused amenities you want, like dual-zone climate control. The new Nissan Armada may look rugged from the outside, but inside you’ll find a premium crafted interior that features distinctive stitching, available leather, and wood-tone trim. Open the Nissan Armada’s cabin to the world around you with the available power moonroof that slides open with the push of a button. The new Nissan Armada has the space you need for everyone and everything. This full-size SUV seats eight and boasts 95.4 cubic feet of cargo space with the rear seats folded. Got a full back seat? No problem! The new Nissan Armada’s available intelligent rearview mirror turns into a camera with the press of a button to provide a wide view of the area behind you. With the new Nissan Armada’s dual-zone automatic climate control, you and your front passenger can select individual temperatures for each area so you both ride in comfort. Nissan equipped the new Armada with the latest in advanced technology to ensure every road trip is exciting. Sit back and enjoy the ride with smartphone integration, Bose® Premium Audio, and SiriusXM® Traffic and Travel Link® at your disposal. Sync your smartphone to the NissanConnect® Infotainment system via Apple CarPlay™ or Android Auto™ and can stream your music, answer calls, and so much more right from the 8-inch touchscreen. Pump up the volume in the new Nissan Armada with Bose Premium Audio that features 13 high-quality speakers and a subwoofer. With the new Nissan Armada, you’ll enjoy a three-month trial subscription to SiriusXM Satellite Radio. Change up your driving soundtrack with over 150 channels of commercial-free music, talk, sport, and so much more at your disposal. The new Nissan Armada features a three-month complimentary trial to SiriusXM Traffic and Travel Link. This system provides turn-by-turn navigation, real-time traffic information, gas station locations, and so much more. 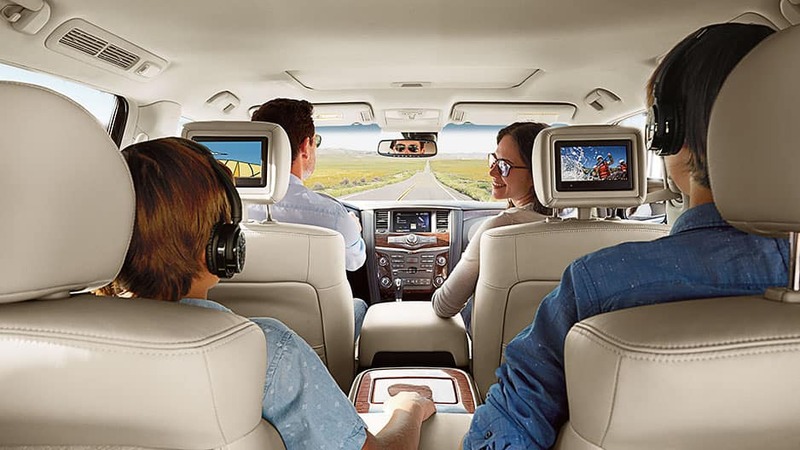 With the Nissan Armada’s available tri-zone entertainment system, you can ensure your rear seat passengers enjoy the ride with dual 8-inch monitors, a DVD player with remote control, two wireless headphones, and HDMI input. Wherever the road takes you, you can rely on the new Nissan Armada to have your back with the Nissan Intelligent Mobility suite of available safety features. Using radar technology, the new Nissan Armada’s available forward-collision warning monitors two cars ahead of you for distance and speed. If the system detects a front-end collision is imminent, it alerts you with visual and audible warnings so you can react in time. The new Nissan Armada’s lane-departure warning detects if you drift from your lane without signaling and warns you with visual and audible alerts. 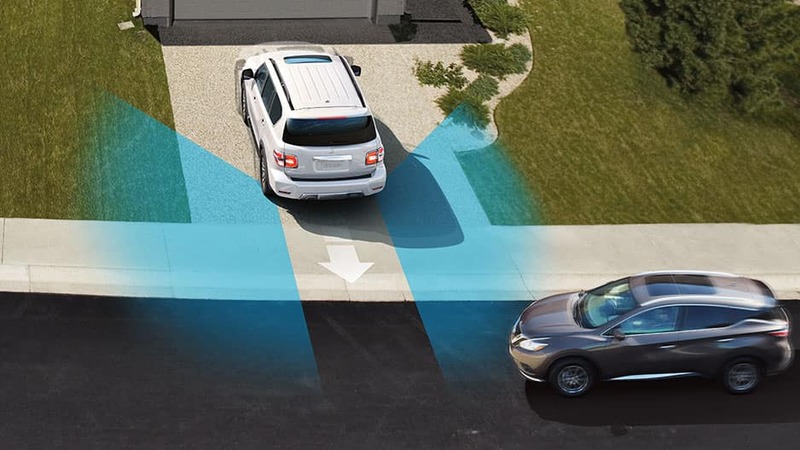 The Nissan Armada’s available intelligent blind-spot warning uses radar to detect when a vehicle enters your blind spot and alerts you with a visual indicator on the side-view mirror. Parking the new Nissan Armada is easy with the available Intelligent Around View Monitor. This system four cameras to paint a 360-degree bird’s-eye view of the surrounding area on the 8-inch monitor. You can also use split-screen close-up views of the front, rear, and curbside. With the Nissan Armada’s available intelligent cruise control, you can set a cruising speed and following distance from the vehicle ahead of you. The system will slow down the Armada to maintain the preset following distance and accelerate back to the original cruising speed when that vehicle is no longer there. The new Nissan Armada is ready for any adventure with its 5.6-liter V-8 engine, available four-wheel drive, and active brake limited-slip system. 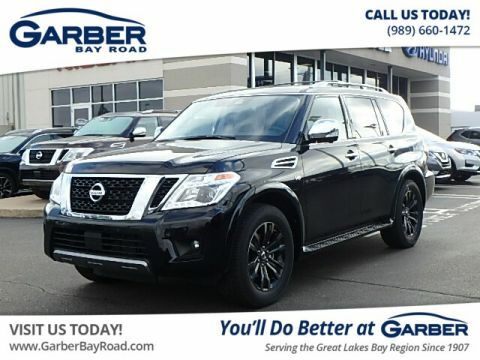 Put the pedal to the metal and feel the power of the new Nissan Armada’s 5.6-liter V-8 engine that delivers 390 horsepower and 394 pound-feet of torque. With the Nissan Armada’s 5.6-liter V-8 engine, you can bring your boat or trailer along for the ride with its 8,500-pound towing capacity. The new Nissan Armada’s advanced four-wheel drive ensures you maintain tight control by detecting when road conditions change and adjusting the amount of power distributed between each axle for optimum handling. the Armada on an incline, this system prevents it from rolling back by keeping the brakes engaged for a few moments as you move your foot to the accelerator. The new Nissan Armada’s active brake limited-slip system helps you maintain traction in rough terrain by sensing wheel spin, applying the brakes to the affected wheel, and directing power to the wheels with the best traction. Leave the boring road trips in the past where they belong and discover a new way to travel with the new Nissan Armada. 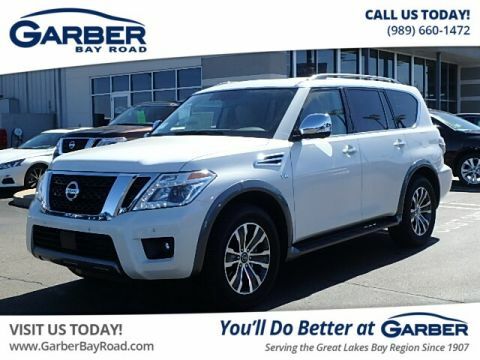 This full-size SUV features the latest in advanced technology features that keep you connected and entertained, like the NissanConnect® Infotainment system. Sync your smartphone, pump up the volume, and discover what adventures await you. Wherever the road takes you, the Nissan Armada will get heads turning. This full-size SUV charges onto the scene with a chiseled body, chrome grille, and 20-inch wheels sure to leave a lasting impression. And with seven eye-catching colors to choose from, the new Armada never fades into the background. All this and more awaits you in the new Nissan Armada. 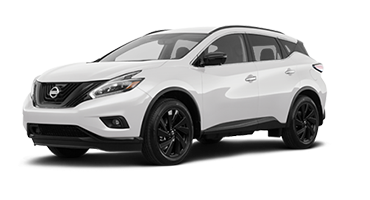 Come take it for a test drive today at Garber Nissan on Bay Road in Saginaw. *MSRP: All prices are Manufacturer’s Suggested Retail Price (MSRP). MSRP excludes destination and handling charges, tax, title, license, and options. Dealer sets actual price. MSRP is for the 2018 Nissan Armada. *MPG: 2018 EPA Fuel Economy Estimates 14 city / 19 highway for Armada® 4×2, and 13 city / 18 highway for Armada® 4×4. Actual mileage may vary with driving conditions – use for comparison only. MPG is for 2018 Nissan Armada.